Recipe modified with permission from PCC Natural Markets. 1/4 cup dried fruit (cranberries, apricots, raisins, etc). Cut pears in half lengthwise and remove the core. Place pear halves face down in a parchment paper-lined roasting pan and cook for 20 to 25 minutes or until fork tender. They will caramelize in their own juices. In a heavy pot, heat oil over medium-high heat and cook cumin, onions and celery for 3 to 4 minutes until crisp-tender. Stir in dried fruit, saffron and couscous. Pour in broth and bring to a boil. Season with salt and pepper. Cover the pot and remove it from the heat. 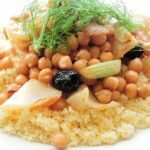 Let couscous steam for about 5 minutes. Remove the lid and fluff with a fork. To serve, cut pear halves into thin slices and fan one on each of 4 plates or just serve uncut, tilted at an angle. Mound with couscous and garnish with lemon wedges, toasted almonds and feta cheese.